Are collectors ready to buy million-dollar artworks online? Some of the biggest names in art and technology are betting on it. Surfing for Pollock, de Kooning and Basquiat. Next weekend, art collectors sitting at computers in London, Toronto and Miami will find themselves face to face with the same work of art, a montage by American artist Robert Rauschenberg. The price for interested online shoppers: more than $1 million. Art executives are hoping to sell million-dollar pieces online, something that flopped when they tried it a decade ago. Ellen Gamerman explains what's different this time around. The question of whether top-tier art can successfully be sold online has long bedeviled the art world. High-end collectors have traditionally been leery of spending significant money on art they haven't seen in person, and a number of online-art selling ventures fizzled early on. But as more and more powerful art buyers emerge from Asia, Russia and the Middle East, the need to quickly reach collectors around the globe has never been greater. And dealers are looking for ways to reach a younger generation that's beginning to explore the art market—without alienating their best clients. Now, some of the biggest names in the worlds of art and technology are betting that collectors will spend millions on paintings and sculptures that they've only seen online. A who's who of top galleries is taking part in the VIP Art Fair, an online-only event where potential buyers can shop for works by contemporary and modern artists like Jackson Pollock, Louise Bourgeois, Francis Bacon and Damien Hirst. Nearly 140 galleries from more than 30 countries—including blue-chip dealers like David Zwirner, Larry Gagosian and the Pace Gallery—have paid to host virtual booths. Google Chief Executive Eric Schmidt, Twitter chairman and co-founder Jack Dorsey and Russian mega-collector Dasha Zhukova are investing in Art.sy, a new service set to launch this spring. The site is designed to help collectors find art based on their personal preferences and past buying history, much the way the music site Pandora guides music lovers to new bands. Pandora CEO Joe Kennedy is advising the company, as is Mr. Gagosian. Mr. Dorsey says the site will appeal to a tech-savvy generation that is beginning to invest in art. "Right now, you have an influx of younger folks who are looking to bridge what they're doing with sites like Twitter and Facebook and Foursquare and all these other companies with their other interests, which include art and paintings and drawings and sculpture," he says. Collectors now seem increasingly prepared to spend big sums for art online. At Christie's, which offers real-time, online bidding at nearly all of its auctions, a Shang Dynasty wine vessel fetched $3.3 million in September, breaking the house record for an item purchased with an online bid. Last month, Saffronart, an online auction house dedicated to Indian art, sold a $2.2 million oil painting in pastel colors by Arpita Singh entitled "Wish Dream." 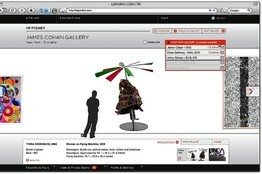 A new wave of digital art ventures is launching as the art market begins to pick up steam again. Auction houses Sotheby's and Christie's sold more than $9 billion worth of art combined last year, nearly doubling their sales from the year before. Prices are climbing again for contemporary art, which fueled much of the art market's last boom before the recession hit. Mark Vanmoerkerke, a private equity and real-estate investor in Oostende, Belgium, sees the Internet as the next logical step in an increasingly global art market. "Me, I'm in faraway Belgium and not everyone lives in New York or London, so I'm used to buying online," he says. For dealers, a virtual art fair can be an appealing way to reach a broad audience at a fraction of the cost of participation in a traditional fair. Amid the economic downturn, some smaller galleries opted to sit out prestigious fairs like Art Basel Miami Beach, where booth rental costs range from $10,500 to $65,000. At the VIP Art Fair, set to run from Jan. 22 to Jan. 30, galleries have paid between $5,000 and $20,000 for virtual booths. Because shipping costs to a booth won't be an issue, the Gagosian Gallery is plucking works from its outposts in Athens, Los Angeles, Paris, London, Rome and New York for the online fair. The gallery plans to offer items too unwieldy to bring to a physical fair, like a 17-foot-high aluminum sculpture by Franz West that looks like a giant pink string with a knot in it. Employees at Gagosian offices across the different time zones will be able keep the virtual booth staffed nearly around the clock. A screenshot of a preview gallery at the VIP Art Fair. On a recent afternoon in the offices of the VIP Art Fair, located four floors above the bustling flower district in Manhattan, Gagosian Gallery art dealer Cooke Maroney sat before a wide-screen computer and practiced setting up virtual private viewing rooms for elite clients at the fair. On his screen, a gray figure depicting a visitor at an art gallery appeared next to each piece of art, changing size to show the works at human scale. To succeed, organizers say the online fair needs to walk a fine line between offering access to newcomers and exclusivity to collecting veterans. Participating galleries have sent invitations to their active clients, giving them instant-messaging privileges with dealers and potential access to a wider variety of works. The largest booths will publicly display 20 out of 100 works on offer; the rest they will show only to their best clients in private online viewing rooms. Visitors without invitations will be able to browse for free, but must pay $100 for a pass at the start of the fair to see price ranges for the works and interact with dealers through the site. Buyers won't drag a painting into their virtual "shopping cart" or buy through PayPal; instead, they'll contact the dealers by instant message, email or phone to arrange a sale. "It is still a world of high art, and there is an elitism that goes along with that," says James Cohan, a New York art dealer and the fair's co-creator. He and his wife, Jane, founded the fair with Internet entrepreneur Jonas Almgren and Mr. Almgren's wife, Alessandra. 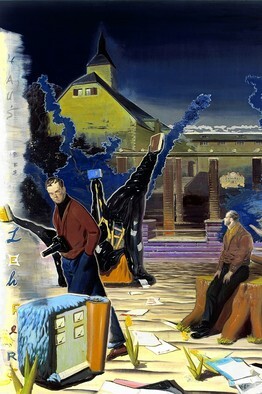 David Zwirner plans to offer 'Haus des Lehrers' by Neo Rauch at VIP. 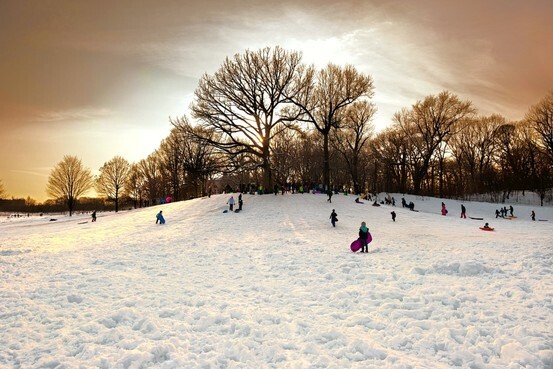 Mr. Cohan signed on the David Zwirner gallery last spring. He says he won over the gallery with a PowerPoint presentation that showed a mocked-up version of a David Zwirner virtual booth, complete with examples by the gallery's major artists. It included a massive painting by Luc Tuymans called "Ballroom," valued at more than $1 million, that depicts a mural of palm trees reflected on a highly polished floor. Mr. Cohan was soon en route to London, Berlin, Sydney, Tokyo and elsewhere to personally lobby dealers to come on board. Mr. Vanmoerkerke, the collector, is drawn by the idea of not having to sprint through a sprawling venue to get to the best art first—a common sight at art fairs in the boom years. "Maybe online you won't need to be like Clint Eastwood with the fastest draw," he says. One thing the online fair lacks, however: the electricity of art-world insiders gathered in one place and watching each other's next move. When Brad Pitt huddled with collectors Eli and Edythe Broad before buying a nearly $1 million painting by German artist Neo Rauch at Switzerland's Art Basel two years ago, for instance, he set the event abuzz. "It'll be interesting to see how it does without all the air-kissing in the aisles that you get at other fairs," says Dennis Scholl, a Miami-based collector of contemporary art who received a VIP invitation to the fair and plans to check it out. "I don't know if they'll be able to recreate that energy. They might." Some collectors still wrestle with the notion of buying a work they haven't seen up close. "There is so much out there to buy, why bother with something you can't see in person?" says London-based contemporary art collector Tiqui Atencio, an art-fair regular. She says she rarely purchases an artwork without personally inspecting it first, but she plans to browse at the VIP Art Fair. 'The Sledding Hill (Dusk)' by Joseph O. Holmes, above, is offered on 20x200.com. Tony Podesta, a Washington lobbyist and contemporary art collector, purchases up to a fifth of his art sight unseen, based on digital photos. But he's made some miscalculations. He and his wife are now living with a giant Campana Brothers couch made of stuffed animals that was far larger than they anticipated after viewing a JPEG of the image on an auction-house website. "I think we thought it was like a regular-size couch," he says. "It turned out to be a much more substantial creature." Online art sales have followed a rocky path. Sotheby's launched an online auction site in 2000 to much fanfare. That year, the site sold an original copy of the Declaration of Independence to sitcom legend Norman Lear for $8.1 million. The sale seemed a promising omen for future online sales, but even then, there were signs of trouble: Lara Bergthold, the executive director of the Lear Family Foundation, was so worried about her spotty Internet connection that she flew from Los Angeles to New York to put in Mr. Lear's bid from a computer in a Sotheby's vice president's office. 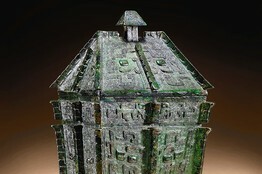 Ultimately, Sotheby's struggled to convince sellers to consign their trophies to an online auction. In 2003 it ended its online sales venture at a loss of $100 million. Last year it began offering real-time online bidding for all its world-wide sales, and in December sold a $1.1 million platinum-and-diamond necklace to an online bidder in Asia. Internet art database artnet closed its online auction business after two years in 2001 at a total loss of $11 million, says Bill Fine, president of artnet Worldwide, but about two years ago he restarted the auctions, believing that people now are more comfortable buying luxury goods online. He says the online auctions sold more than $12 million in art last year, though so far that venture has yet to turn a profit. Art sites drawing a new generation of collectors focus on a carefully curated selection of lower-priced prints and photographs. Exhibition A, a recently launched online venture by New York art dealer Bill Powers, concentrates on contemporary prints. Another site, 20x200, founded in 2007 by New York dealer Jen Bekman, features photographers like William Wegman, known for his portraits of Weimaraners. Mr. Wegman attributes his strong online sales partly to the way his images look on a computer screen. "It's kind of luminous, in a way—it's very attractive, almost more than printed," he says. 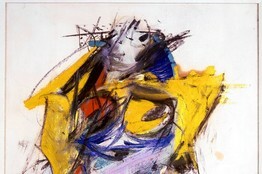 Detail of Willem de Kooning's 'Woman." The work may be featured on Art.sy in the spring. Other entrepreneurs see potential in a model that's already being used to sell music. Art.sy founder Carter Cleveland, a 24-year-old computer-science engineer whose art-obsessed father took him to galleries as a child, helped develop what he calls the "Art Genome," a mathematical framework using data provided by gallery professionals to help select new works for collectors based on their personal preferences. (One of Art.sy's investor/advisers is Wendi Murdoch, the wife of Rupert Murdoch, CEO of News Corp., which owns Dow Jones & Co., the publisher of The Wall Street Journal.) 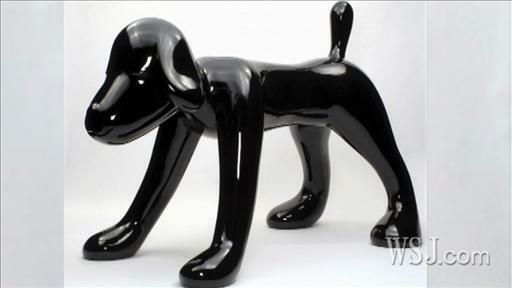 Art.sy will include works at a range of prices, including some big-ticket items. One work that may be featured on the site is "Woman," an abstract shock of yellow, blue and red by Willem de Kooning, valued at more than $7 million, offered by Acquavella Galleries. Ms. Zhukova, who is the companion of Russian billionaire Roman Abramovich, is both an investor in Art.sy and the site's creative director. She says that until now online ventures haven't featured the best art. "In the past, the types of work available through online sales have been pieces that went unsold at exhibition," she wrote in an email. "Those portals aren't designed for discovering new artists or cultivating personal relationships with galleries." Mr. Scholl, the Miami collector, isn't convinced that a computer model can predict an art lover's taste. "How can anyone tell you exactly how their head works when they look for art?" he says. "You collect via your subconscious, and it's hard to write an algorithm for that." He paused for a moment, then added, "The funny thing is, I use Pandora all the time." Amazing Interview, very inspirational. Great interviewer & superb artist. I love getting lost in Vanessa's world of fantasy & enchantment.